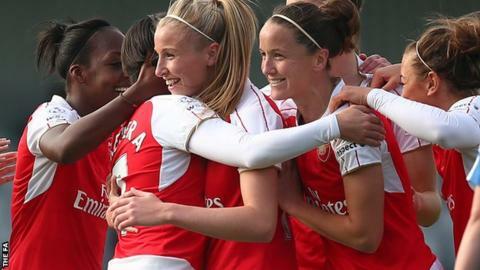 Arsenal Ladies reached their fifth consecutive Continental Cup final with a 3-1 win over Birmingham City. Spain's Marta Corredera curled the hosts into an early lead before England striker Dan Carter doubled their lead moments later. Alex Scott made it 3-0 straight after half-time, before Kirsty Linnett pulled one back for the visitors. Three-times winners Arsenal will now face Notts County Ladies in the final at Rotherham on 1 November. In a repeat of the 2011 and 2012 finals, Arsenal made an energetic start and Carter struck the crossbar before Corredera's sweet strike from the edge of the area opened the scoring. Carter than raced clear, one-on-one with Sophie Baggeley, and calmly lobbed over the Birmingham goalkeeper. The Blues responded well to falling two-goals behind but Karen Carney's deflected shot was turned on to a post by Sari Van Veenendaal, and bounced back across the face of goal and clear. After the break, Arsenal made the win safe with Scott's powerful finish, before Linnett's well-struck consolation. In a bad-tempered second half, Carter drilled wide after a superb knock-down from Jordan Nobbs late on, but a two-goal cushion was sufficient to see Arsenal through. "We have been starting games well. I'm very happy with that. "The best feeling today is to offer the fans victories in the last three home games of the season. I'm proud of the players, the staff and the team. "This is the reward for everybody's efforts. We have to do everything possible between now and the final to prepare." "Arsenal were the better side in the first half, that's won them the game. "Defensive errors and mistakes in that first 20 minutes were the difference. "Looking at the second half display, for long, long periods we were the better side and we really showed our quality." Arsenal Ladies: Van Veenendaal, Scott (c), Stoney, Losada (Yankey), Natalia (Ubogagu), Nobbs, Carter, Williamson, Corredera, Rose, Janssen (Sampson). Subs not used: Byrne, Humphrey, Kelly, Bailey. Birmingham City: Baggaley, Sargeant, Carter, Mannion, Harrop, Allen, Linnett, Carney (c) (Wellings), Potter, Lawley, Westwood (Ayisi). Subs not used: Windell, Hill, Haines, Peplow.